Stone has a long history in architecture. From ceremonial stone runes in the European continent, to the polished, white stone in Greco-Roman classical orders, to mountain-shaped stone temples of Southeast Asia, to the stone block pyramids in Latin America, stone is one of the most commonly used building materials you can find across all continents. Even in the modern era, when masonry and wood buildings were commonly used and steel and concrete were beginning to be explored, architects were still using carved stone to create intricate detailing, and huge stone blocks to create buildings with the feeling of massiveness. Developed during the 1880s and 1890s, this use of stone was an adaptation to the economic, technical, and cultural needs of the time. Louis Sullivan, an American architect based in Chicago, was one such visionary that integrated stone into the early skyscrapers as a part of the “Chicago Style." The combination of a steel skeleton and the use of light terracotta, fulfilled Sullivan’s wish to create an “organic” type of architecture that can be seen in many of his commercial buildings. Henry Hobson Richardson, another Chicago architect, developed a use of stone detailing on his building’s exteriors that was so distinctive it went by the name “Richardson Romanesque." In contrast to Sullivan’s work, the configuration of proportion, massing, and masonry of these buildings visually inferred a heaviness, making them seem anchored to the earth. Stone work was usually square-shaped, called Ashlar, with rough exposed faces, sometimes referred to as rustication. Limestone, granite, and sandstone were commonly used materials. Concurrent to these architects’ work was a period known as the “City Beautiful Movement” that swept through American cities. This movement focused on both city and landscape planning as well as architecture. The buildings created during this period are quintessential examples of Classical detailing. The stone of choice to make columns was either limestone protected by a layer of marble dust stucco or pure white marble. With the development of cast stone at the end of the 19th century, classical detailing could also be made with a mixture of stone and concrete, a cheaper, and much less work intensive alternative. Uses for stone have been re-imagined for centuries. Even now, architectural stonework provides an impression of solidity, and care in craft. This mantel references the 19th century in its use of a curved arch and a detail piece made from curved metal with petal details at the arch top. While the mantel seems a little simple to be from the Victorian era, its curved top and intricate use of marble and metal suggests its use in a revival style house such as the Italianate or renaissance revival style combined with a federal or colonial style shield at the top of the arch to create a les ornate early Victorian era center piece. Heating was an important issue for 19th century Americans, and even after central heating had been installed in most houses, the fireplace retained its symbolic and decorative importance. Add warmth and luxury to your living room with this mantel piece. Architectural ornaments featuring mythical or grotesque figures for decorative purposes are known as chimerae. Decorative figures of the 15th century grotesque style are meant to evoke a feeling of uncomfortable bizarreness as well as sympathetic pity. Grotesque carved forms and other stone heads were commonly used in in Gothic style buildings. This piece would have likely served as a portion of the top of a capital on a column, or the keystone at the center of an arch. The solid granite could easily withstand the outdoors, so place this outside an entrance, or repurpose it into a table, shelf, or seat base. In the 19th century, the possibilities of terracotta decoration of buildings was greatly appreciated by architects, often using thicker pieces of terracotta and unflat surface. Terra cotta is a type of material that provides the opportunity to create glazed ornamentation and designs that would have been impossible to execute in any other medium used during that time. The curling foliage and letter font suggests having been made during the Victorian era time period. These letters originally came from a hotel in New York, and were then moved to Grandma’s restaurant in Minnesota, before coming to Architectural Antiques. Add some playful style to a room for entertaining guests, use as a unique bedroom decoration, or place outside a front entrance. This sculpture of a head references the popularity of sculpted heads in the first few centuries of the Italian peninsula. Like its predecessors, this head had long locks of curling hair. This is likely a revival piece to evoke the Classical style during the period of Greco Roman power in Europe. This piece was used in a church with Classical style architecture. It’s more common for old buildings with terra cotta ornamentation to be dismantled than buildings made from heavy stone such as granite, due to the solidity of such dense stone. Bring some classical style to a space, and hang this near other unique room pieces. These capitals evoke the Classical order of architecture in their use of acanthus leaves, scrolling, ornamental designs, and use of layered flowers. Limestone is a soft rock that is relatively easy to carve and can have a wide variety of textures. In carving limestone, this stone does not polish well, but it is one of the best stones for showing details carved into it. Limestone is good for outdoor sculpture due to its ability to withstand acid rain. Repurpose this strong base into a porch seat by adding padding to the top, or use this as a magnificent coffee table or decorative focal point in a room that uses similar colored stone. This dark slate material, with the gold and black painted detailing add a dark warmth the any household. Likely a centerpiece for a house during the Victorian era, this mantel also features an intricately crafted iron cover shaped into floral patterns. Slate, being fireproof, was a good choice for fireplaces, and was known as “the poor man’s marble.” This mantel references some features of the Eastlake style in its simple geometric form, and geometric painted designs. Place this mantel in a unique room where the warm brown and red tones add to the comfortable feeling of the room. Cast stone is a concrete masonry technique that mimics the look of cut stone. Panels like these would typically be used for trim or ornamentation for facing buildings or other structures, and for garden ornaments. The practice of using cheaper or more common materials on building exteriors in imitation of more expensive natural materials, had been done for centuries. The use of cast stone grew rapidly with the development of the cement and concrete industries at the end of the 19th century. 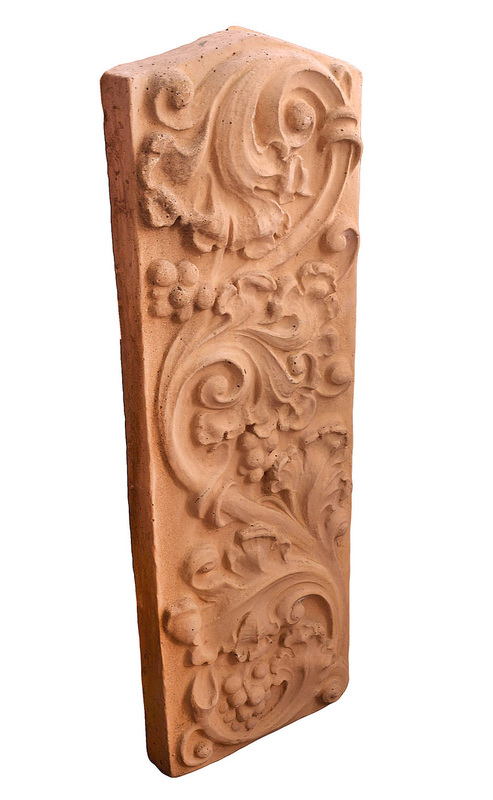 Place this around an exterior entrance way, above or to the side of a mantel piece in a living room, or use one of the panels in a room just to add a touch of carved foliage detail. 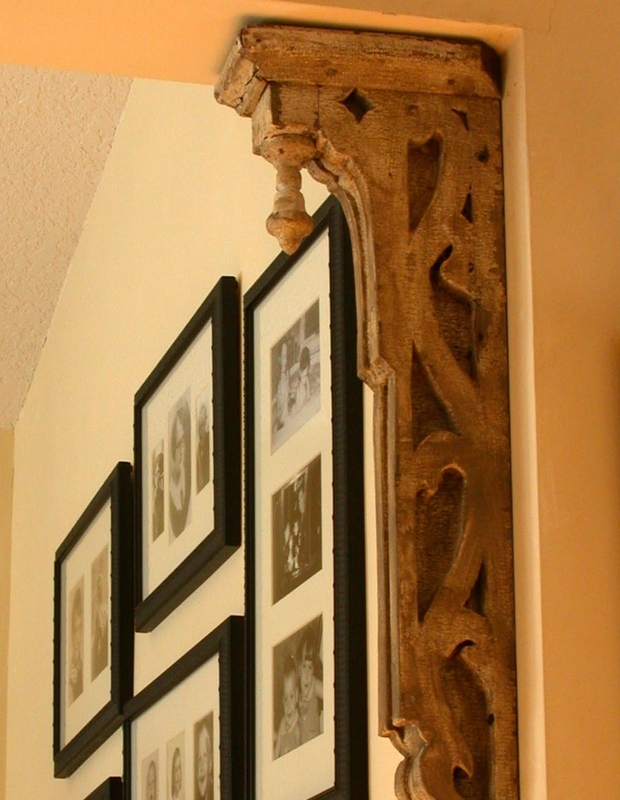 This Tudor style mantel was likely produced for a Tudor revival style house of the early 20th century. Typical Tudor style ornamentation including a crest with lions and helmet, acanthus leaves along the front, and a fleur de lis at the top of each column. The cultured stone is another type of cast stone commonly used during this period, made to look like a creamy marble. This way, the mantel could be easily carved and created without the cost and mass of real marble. Add an inventive Tudor style look to your home using this impressive mantel piece. During the 19th century, Queen Victorian commissioned Henry Doulton to produce a water filtration device to treat infective water. This was the first instance of a small personal device for filtering water. The small pore size of the porcelain, a type of ceramic, filters dirt, debris, and bacteria out of water. In some developing countries, ceramic filtration is still the preferred method for filtering because it is very effective at eliminating bacteria and other pathogens, and most importantly, because it is culturally accepted. While these ceramic balls wouldn’t be as effective at filtering water as our large scale systems today, these ceramic water filters would be perfect to use in a rain barrel or in a garden water feature on a rainy day.